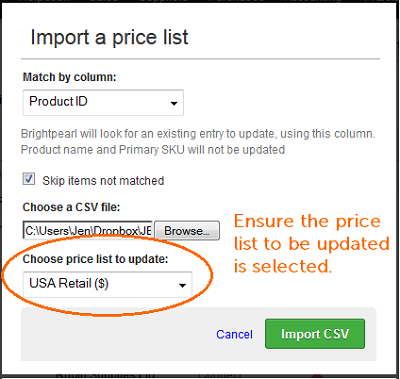 The price list import can be used to import prices and volume discounted prices (price breaks) from a spreadsheet. The product import can also be used for importing item prices, but not for volume discounted prices (price breaks). All prices should be imported as net (excluding tax), even for price lists that are set as "show prices as gross". All prices are stored in the data base as net and then Brightpearl will calculate the gross value to display to the user based on the tax codes applied at the time. This is a system assigned ID for the product. It can be seen just below the product SKU on the product list. It is exported with each product. It can be used for matching the product for the import. Product ID and the corresponding SKU must match or the update will be skipped. This is the name of the product record. This column can be left blank but must be included. This is the main product SKU assigned to the product. It can be used for matching the product for the import. A supplier SKU is one recorded against a price list for the product. This column can be left blank but must be included. Every product requires a price per item, in which case a "1" is entered. To add additional prices, for example the price for 5 or more items, 10 or more items, 20 or more items, enter "1; 5; 10; 20". This column must include at least "1" in order to import a price. Every product requires a price for a single item. Additional prices can be added by using the previous price break column. For each break entered a price can be entered in this column, each separated with a semi colon, for example, "5.66; 5.20; 4.99; 4.80". All prices must be net (excluding tax). If you are updating your price list due to discounting certain items for a limited time; then the steps above might not work best for you. The steps above are used to update your prices permanently; and if you wish to put your prices back to the original value then a second import is required. In this case, you might want to consider creating a new price list called 'Holiday Season Discount' or similar to be used just for the period you are discounting items for.